Hello there. Here's a little bit about myself. Inkland's been up for about 20 months and gotten away without an "about me" section, so I threw this together. Programmer by day, I wrote my first commercial game in 1986, started programming games for a living in 1987 at the now defunct software house "Wise Owl Software". From there I went directly to Krisalis Software (then called Teque Software Ltd) doing conversions for the Sinclair Spectrum, MSX and Amstrad CPC computers, then moving on to original titles for the PC. Airport Inc. was the last one I worked on. 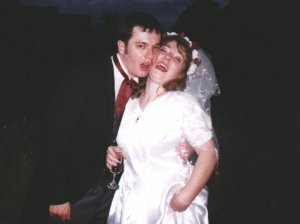 I left Krisalis in March 2001 (coincidentally, Krisalis went into liquidation shortly afterwards) when I decided that I fancied a change and left the computer games industry to work for the IT solutions provider EDS. In 2003, I left EDS to go and work for the BBC at the Gamezlab game studios in Dewsbury (well, you can't turn down an offer to work for Auntie Beeb can you?). I worked on the software for the BBC3 program (and shortly afterwards, the PC and PS2 game) Fightbox. It was probably the most intense coding session I've ever been involved in. We wrote the "Fightkit", TV studio, PC and PS2 software all within a year. We also got to spend a day down at the BBC studios seeing one of the episodes being filmed and I managed to get my mush on the screen, being interviewed by Lisa Snowdon. Once Fightbox was out of the way, we started work on a new game engine for a game based on the TV program Spooks. In 2004, I left Gamezlab and returned to EDS just after we produced a technology demo of the engine, which was shaping up nicely I have to say. Shortly after I returned to EDS, the BBC decided to shut down the Gamezlab studio and neither the Spooks game or the shiny new engine saw the light of day. 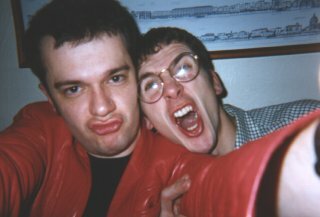 Me and the missus practice "gurning" on our big day in 1996.
responsible for the various monkeys scattered about on Inkland.